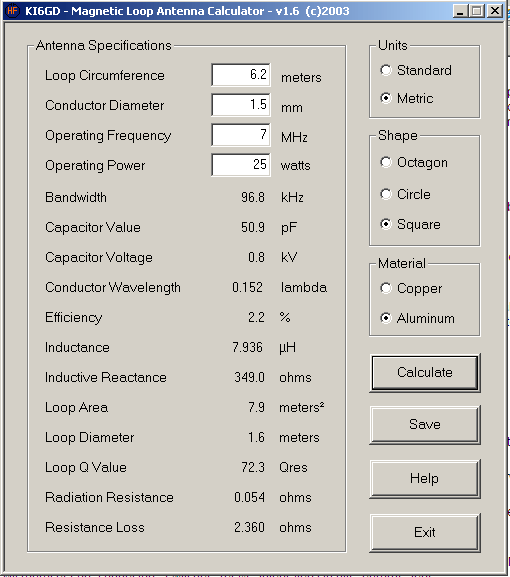 It’s a light magnetic loop antenna calculator that run on MS Windows, and allow to calculate capacitor values and voltage based on Loop circumference, conductor diameter, desired resonant frequency and the operating power. Works either in Standard and Metric units, and let you choose on material, and loop shape, as circular, square or octagon. Does not requires setup or installation, is a simple executable that can be lunched directly. This software should not be used for loops having a larger circumference than 1/10 lambda. The resuls then become faulty. Read his loop article why this software is not valid under that conditions. Salve buon giorno. Avrei intenzione di costruire una antenna loop magnetica per i 145,5 mhz da utilizzare sul mio portatilino. Ho navigato su vari siti ed i programmi che ho trovato per calcolare il loop si blocca sul parametro lunghezza del loop. Gentilmente mi potresti dare una dritta? Very nice, program, BUT only for 1 – 30MHz. If I want to design for 144MHz, where do I start? Many thanks – just what I was looking for! A program to confirm my own calculations (I wasn’t ‘that’ far out). Much appreciated Simone. 73’s Lin M0TCF. Seen your mag loop calculator , thanks for helping Hams ! My problem is , tried to down load it to my I pad ( apple) but no luck! Do you have a version for it? Any way , I am thankful to you! Kindest Regards ! Merry Christmas and Happy New Year! 73! Hi, not sure it will run on an iPad ! This is a fine calculator but I agree with Alan… I need to calc for antennas in the upper VHF and UHF TV bands (174-216 mhz and 470-700 mhz). Also, I was hoping for a calc to do receiving antennas. This is for transmission only (it asks for operating power in watts), so very limited for many of us. Would we have to input 0.000001 watts for good result?